Today, 75 years later, those migrants are still coming. They’ve left their homelands, torn apart by war, religious persecution, drugs, gang violence, natural disasters, and political and economic upheaval — factors that often feed into each other. Not only have they fled places such as Syria and Iraq, but countries in Central America. Estimates this year placed the number of immigrants worldwide at 65 million — 21 million of them refugees — with many millions more labeled “internally displaced” only because they still live within the borders of their birth country. Refugees and what to do about the situation raised continued attention during the marathon presidential race. The United States, cognizant of the swelling number of refugees, accepted roughly 100,000 from around the world for fiscal 2016, which ran Oct. 1, 2015, through Sept. 30, and announced its intent to accept 110,000 in fiscal 2017. However, with Donald Trump’s electoral victory, no one can say for certain what U.S. refugee policy will look like. Conventional wisdom, though, suggests the 110,000 mark will not be met. A continuing resolution to fund the federal government through April 28 capped the funding for refugee resettlement. At the same time, a bill that would have increased funding to accommodate the 110,000 figure was not voted on before Congress adjourned. “The incoming administration would have the purview to adjust that planned number,” said Bill Canny, executive director of the U.S. bishops’ Migration and Refugee Services. Last year, MRS and its diocesan affiliates resettled 23,643 in fiscal 2016, plus another 73,623 who entered the United States through a special immigrant visa program that recognizes their service to the United States in their home country — but despite the difference in status, they have the same needs as refugees, bringing the total to 97,266. MRS is the largest of nine U.S. resettlement agencies helping refugees. MRS’ network of affiliated diocesan programs grew this year by six to 95 — likely a response to the Syrian crisis, according to Canny; it takes about one year for dioceses to set up the capacity, and the buy-in, to do this work. Some Trump backers have called for a registry of Muslims in the U.S., perhaps in the form of a database for visitors and new arrivals from Muslim countries. Others have called for withholding federal funds for self-styled “sanctuary cities,” where elected officials have pledged to not cooperate with federal officials to arrest immigrants in their areas who are in the country without legal permission. Jill Bussey, an attorney who is director of advocacy for the Catholic Legal Immigration Network, said that by her count there are about 400 sanctuary jurisdictions, cities, counties and the like. Some colleges also have declared themselves sanctuary campuses. Christians, Yezidis and others who do not subscribe to the worldview of Islamic State have been fleeing their ancient homelands in Iraq and Syria since the Islamic militant group made surprising incursions deep into Iraqi and Syrian territory in the summer of 2014. 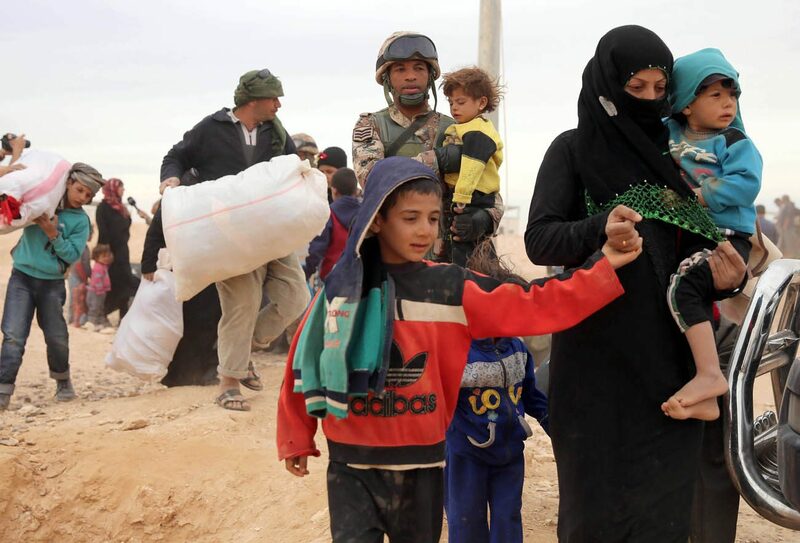 This spring, the United States declared Islamic State’s actions as genocide, although it is an open question whether those who have been displaced will return to their homelands even after Iraqi armed forces have retaken much territory. A University of Notre Dame professor and a student undertook a study which indicates that, over a 20-year period, refugees arriving in the United States actually contribute more to the economy than they take from it. William Evans, chair of Notre Dame’s economics department, and Danny Fitzgerald, a senior economics and mathematics major, used census data to analyze a quarter-century of data gathered from 18,000 refugees to determine their economic impact. “You see a lot of claims by Congress about the cost of refugees, but they really aren’t backed up by data,” Fitzgerald said in a statement. Initially, refugees ages 18-35 are typically underemployed and use public aid programs. But over the course of 20 years, refugees adapt to American life and, on average, pay more in taxes than they receive in benefits. Further, refugees entering the U.S. before age 14 tend to graduate high school and college at slightly higher rates than their U.S.-born peers. The justices, in a split 4-4 vote, effectively affirmed a U.S. District Court judge’s decision blocking implementation of President Barack Obama’s executive order implementing a program for parents of citizen children called the Deferred Action for Parents of Americans and Lawful Permanent Residents program, known as DAPA. A panel of judges on the 5th U.S. Circuit Court of Appeals had affirmed the District Court ruling.